Thank you for you for your continued interest in No Strings Attached. 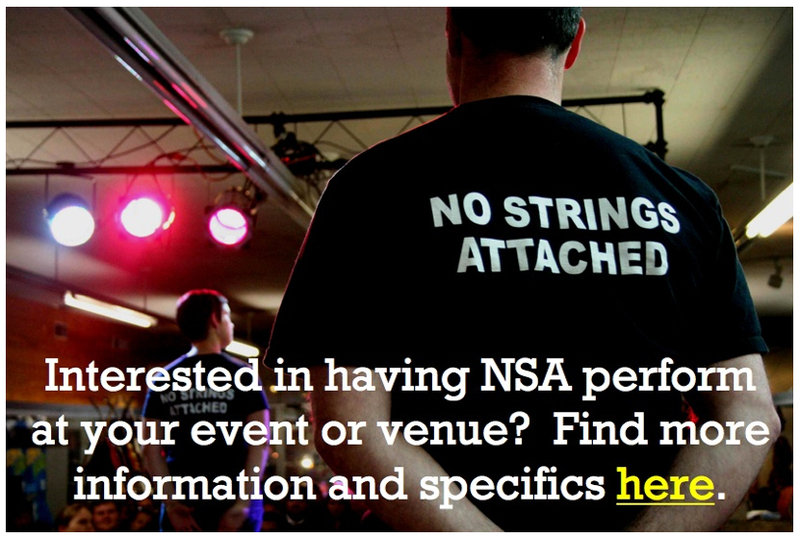 We know you have many choices for your improv needs, and we appreciate that you continue to choose NSA. Make your joking even more practical by practicing with *US*! Once a month, we invite the Local Awesome (that’s *you*) to come play improv with us and show us what we’re missing out on, and maybe convince you that we could one day be as cool as *you* are. Goal: Meet awesome people & have lots of fun! Topics: Potential for adult content. High School & older only. Open-Practice with NSA – Tuesday, Feb. 25th! You think you’re funny, don’t ya’? DON’T YA!? Whether you’re a seasoned improv professional, an actor looking to stretch your talents, or someone who’s never been on stage but wants to try something fun and new … you’re invited! WARNING: Potential for adult content. 18+ preferred. Posted by NSA Improv	| February 19, 2014 | Categories: Upcoming Events | Comments Off on Open-Practice with NSA – Tuesday, Feb. 25th!